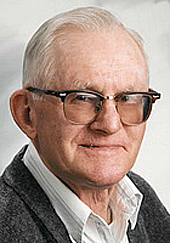 GIBBON — Roland Meyer, age 91, of Gibbon passed away Sunday, April 7, 2019 at the Southview Living Center in Gibbon. Funeral Service will be 11 a.m. on Monday, April 15, St. Peter’s Lutheran Church in Moltke Township with Pastor Benjamin Rucker officiating. Burial will take place in the church cemetery. Visitation will be from 1 to 3 p.m. on Sunday, April 14, at St. Peter’s Lutheran Church in Moltke Township. Visitation will continue on Monday, April 15, from 10 to 11 a.m. at the church. Roland is survived by his nieces; Laurie (Jeff) Beilke, Jody (Joe) Brey; nephews, James Meyer, Lonnie (Terri) Meyer and Russell (Lisa) Meyer. He was preceded in death by his parents; his sister’s one in infancy and Erna Meyer; brother, Harry Meyer in infancy and Arnold (Dorothy) Meyer. Roland Meyer was born Jan., 29, 1928 to Martin and Laura (Baumgardt) Meyer in Moltke Township, Sibley County. He attended District 62 Country School and St. Peter’s Lutheran School. Roland farmed for his entire life in Moltke Township. He played the concertina in various Gibbon Polka bands. He enjoyed fishing and watching baseball especially the Twins. Roland was a member of the St. Peter’s Lutheran Church in Moltke Township, Sibley County.